Like most runners training for a big race, I’m terrified of getting injured. The idea of having to back out of my first half marathon (the AllState Fort Lauderdale Half) haunts me with every new little ache. The past couple of days I’ve been feeling some soreness in my right achilles which overnight spread into a little bit of soreness below my heel. Yes, I am literally petrified that this is the beginning of plantar fasciitis, but I’m 99.9% sure it’s just achilles tendonitis. I’ve started doing achilles stretches – found on the NYRR site – which temporarily relieve the soreness. Along with some Ibuprofen I’m feeling good. I sent my running coach a text this morning about the soreness in my ankle/heel, holding back a freak out, and she replied with some calming words. b.) Don’t worry you might just be getting used to your new shoes. I switched from the Brooks Dyad 7’s which were never really a great fit for me despite my local running store recommending them. I did my 7-miler over the weekend in the Adrenalines and they felt great! I love how the sole is much firmer than the Dyad. Also, the Adrenaline is a top-notch stability shoe which I really need. Hopefully my achilles will start feeling better and I’ll be running again in just a couple of days! I can’t wait to take the Adrenalines out again. Are you more scared of getting an injury before the race or starting the race and DNF’ing? What’s your favorite song to listen to during long runs? This post was written on Monday night, so hopefully by the time you’re ready this on Wednesday (or later) I’m back to normal! Previous Post I (FINALLY) Ran 7 Miles – I’m Halfway to the Half! i FINALLY got fitted for shoes this past weekend. 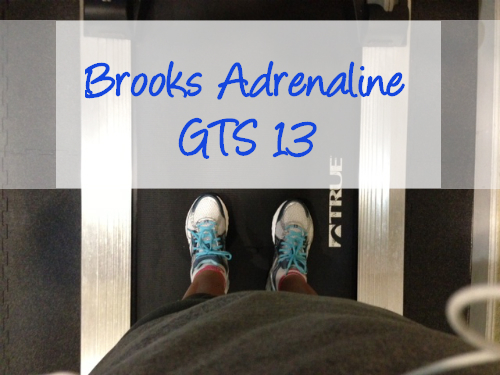 Brooks Adrenaline were one of the ones recommended for me! I haven’t splurged yet and made a purchase of new running shoes yet (current ones aren’t QUITE at that point to be retired yet), but good to know that you love them so far. 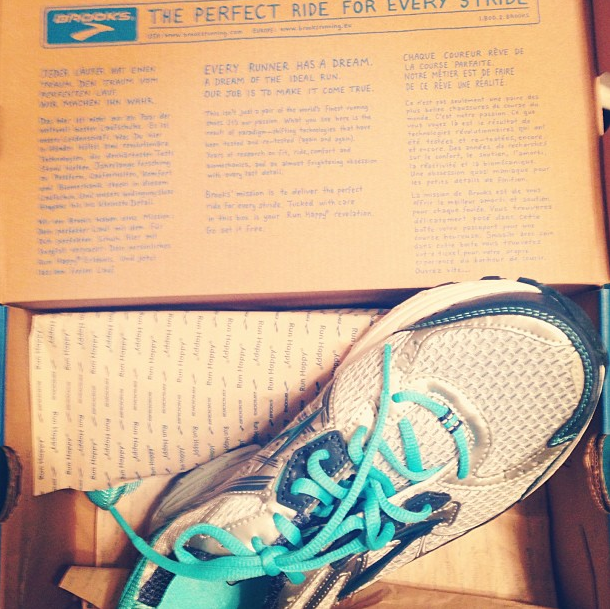 Kayano was also suggested for me and I know Ali @ abkruns.com LOVES her Kayano. Hope your soreness is getting better! Thank you! I did 5 miles tonight and there was no soreness – fingers crossed that it stays this way! Ah, and of course when I hit submit the italics are not there. sigh. Yay, glad the Adrenalines treated you well!! Sounds like maybe you’ve found your sole-mates :o) A little discomfort is totally normal, like your coach said. I mean moving from the Dyad to Adrenalines is a big step down in support, so it makes sense that your muscles need to adjust. Remember to wear the Dyads a couple times between the Adrenalines so you adjust slowly.